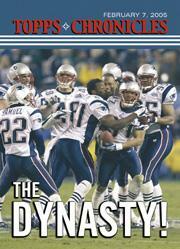 "TOPPS CHRONICLES", which chronicles the most significant news stories of 2005, pays tribute to the New England Patriots' Super Bowl XXXIX win. Every Monday in 2005, collectors have the opportunity to purchase a trading card depicting the previous week's most dynamic news story. This week features the Super Bowl champs. Each card in the Topps Chronicles collection is available exclusively on-line at www.topps.com. Individual cards are available for $4.75 each, while monthly and yearly subscriptions to the program are offered at discounted rates.